Our last Bolivia Expedition of the season is currently underway! The team, lead by long-time guide Mark Johnson, finished the Taquesi Trek today and is currently in La Paz. They will spend tomorrow resting and organizing themselves before they leave for the first of their ascents on Saturday. To read Mark's almost daily cybercasts on this trip, please visit our Dispatches page. To speak with a program coordinator about our 2008 Bolivia Expeditions, please call Andy Bourne at 800-424-2249 or email him at abourne@aai.cc. A climbing party within reach of the summit of Mt. Baker. Photo by Don Enos. This is a great program for beginning climbers (only previous backpacking experience and good fitness is required) and also for those who have climbed in the past but who may be a bit rusty with mountaineering skills. Those of you from the Northwest know that September is typically a beautiful, clear month, so conditions on the glacier can be quite reasonable. If you are interested in joining one of these climbs, please get in touch with Natasha Caldwell at natasha@aai.cc, or by calling 800-424-2249. We hope you have fun checking the photos and video out! If you have any questions on any of the above courses, you can contact us at 800-424-2249. Well, it happened. I stayed at work long enough yesterday for the sun to make it into my west-facing window at the end of the day. In my little corner of the AAI office, I have a small window that looks out onto bustling 12th street in the Fairhaven district of Bellingham. It provides brief opportunities for people watching, checking the weather, and other miscellaneous distractions from my computer monitor, the phone, and the other things that I really should be doing throughout the day. Having weathered nearly 8 seasons in this little corner, my heart always sinks a bit when the sun finally makes it low enough in the sky by the end of an almost typical work day for me to have to drop my blind to continue working. Allow me a tangent if you will to explore the dichotomous nature of this particular circumstance. I have always thought it strange that, working for a mountain guide service, one would be required to shut out the very thing that I by nature and instinct, am most in search of on a daily basis when outside this office...sunshine of course. An odd paradox in the life of an office working/guide/mountaineering sort of fellow. Anyhow, so it has happened. The early setting sun signals that the days are not as long as they used to be, and fair weather weekends are starting to be in short supply. Fear not those of you who have yet to capture their grand adventure for the year or who have not yet taken the chance to step away from the cubicle or work place whatever that might be. There is still plenty of hope for that trip or climb you have been dreaming about since the dark days of winter faded so many weeks ago. Here are a few recommendations for the late summer and fall, as well as a few photos to inspire you. 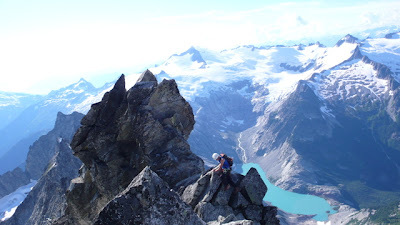 -A weekend of alpine rock climbing on the granite spires of the Washington Pass area, North Cascades, WA. -Walk, scramble, or rope-up for some of the best alpine granite in the country in the Eastern, Sierra, a lifetime of possibilities. -Like to sweat and gamble? Vegas might be a good choice for some hot climbing in the early season sun. -Been sweating too much? Escape on a glacier in the North Cascades. 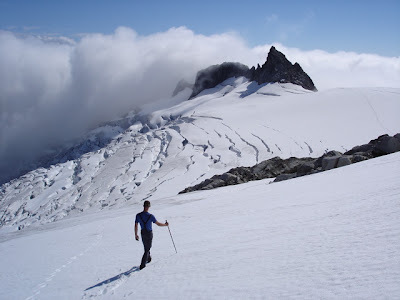 Eldorado Peak and Mount Shuksan make great late season glacier climbs after many of the glacier routes are out of shape for the year. 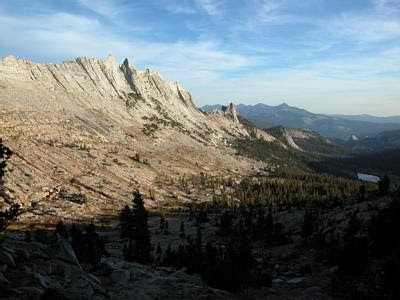 If I was able to sneak out of my corner for a few days, you can bet it would be to the Sierra. Fall down there is gorgeous, and many of the summer visitors have gone back to work, school, and regular life. I have been there 3 or 4 times in September and haven’t seen so much as a cloud in the sky in nearly two months of climbing days in the high country. GO! 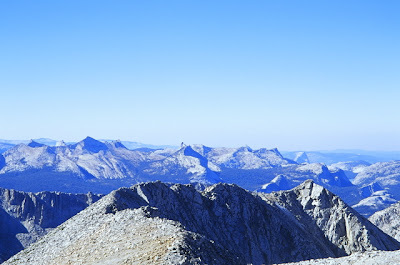 The Mathes Crest and High Country of Tuolumne Meadows, High Sierra. High alpine granite domes in the Eastern Sierra. “While Americans of all races and ethnic backgrounds regard the U.S. National Parks as a very important part of their heritage, ‘diverse’ is not the term that best describes the visitors to our parks and the backpackers and climbers in the backcountry,” according to Dunham Gooding, AAI President. Dunham, who serves as president of the Board of Directors of the North Cascades Institute, one of this nation’s premier environmental education centers, announced today that seven proposals in North Cascades National Park are among the 201 totaling $370 million selected to celebrate the coming NPS centennial. One of the programs will be a three-day Mountain School for 5th through 8th grade classes operating out of the NCI Environmental Learning Center on Diablo Lake. The other will be ten-day Ross Lake, canoe based backcountry program called North Cascades Wild that will include adventure, science education, and service projects. -To comment on this post, contact Dunham Gooding at info@aai.cc or by calling 800-424-2249. The Northwest Face is the third route I have climbed on Forbidden Peak, and without question, it has been the best so far. 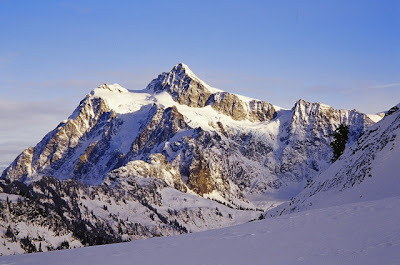 Forbidden Peak sits along the crest of the Cascade Range in Washington State. The West Ridge is an ultra popular (50 Classic Climbs) route that can get crowded on the right weekend. The East Ridge is equally as good, but less popular due to the slightly more difficult rating. 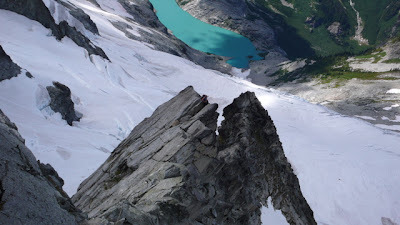 For years I had known about a route on the Northwest Face, and though I had gazed at Forbidden from dozens of peaks in the neighborhood, I had never actually stopped to have a look, scan the guidebook, or ask other climbers about this particular route. Being pretty far from the beaten path, I figured it was like most somewhat obscure Cascade Routes, low quality and hardly worth the effort. In early August of this year, I found myself with one of those coveted free weekends and was faced with the enjoyable task of figuring out what to do and where to go. About that time, I happened across a few photos on the internet from a recent trip to the NW Face. 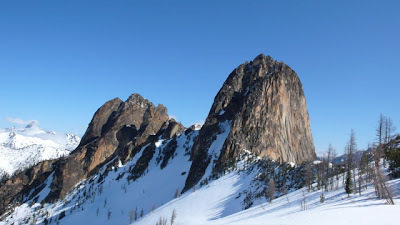 After a moment of inspection, I had to do a doubletake to make sure I wasn’t reading a trip report about the famed North Ridge of Mount Stuart or some golden granite mecca like the Sierra. 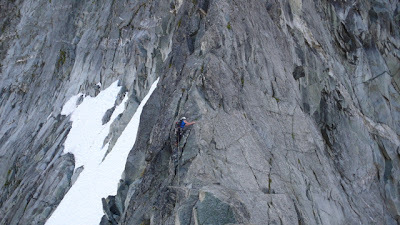 The route was more of a knife-edge ridge than a face, the granite was clean and solid, and the position on the remote north side of Forbidden looked spectacular. Needless to say, I didn’t have to look any farther for weekend plans. My partner for this climb was Andy Niskanen. 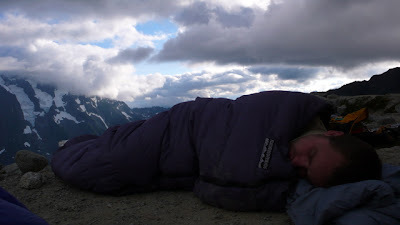 Andy and I usually hook up for a climb or two a year here in the Cascades, and we never fail to wind up tired, a bit strung out, and super satisfied after the outings. Andy likes to give the credit for our perfect alpine track record to his favorite shirt, nicknamed the Hasselhof, which he wears with pride on every climb we do. I on the other hand, am not sure why things always tend to go smoothly for us in the mountains. Maybe two wrongs do make a right? Once again, Andy was the perfect partner for the trip and things went about as smoothly as they could have. The approach to the NW Face requires that you nearly climb the mountain before descending onto the north side of the peak. 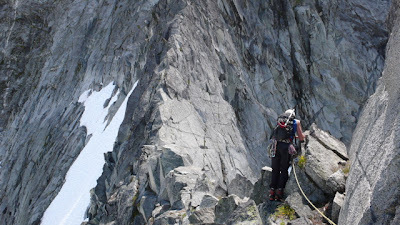 From a col below the West Ridge, only a few hundred feet from the summit, you have to downclimb, make five rappels into the unknown, and drop onto a glacier before descending even farther to gain the start of the climbing route. The route itself is long, dramatic, and absolutely gorgeous. As with most mountain routes, you find a few wiggly holds and loose blocks from time to time, but all in all I couldn’t believe the high quality of the route. Aside from one steep and pumpy 5.8 that felt quite difficult in boots/approach shoes, the climbing was mostly in the low to mid-fifth class range. This climb was a good reminder of how many hidden gems can easily be overlooked in just about any range. It is easy to focus on the routes that are well known, well documented, and easy to get to. When you start to run out of ideas for new and exciting climbs, poke around a little, dig a little deeper, and you just might discover the best route on your own Forbidden! An early bed time in preparation for an early rise. Clouds fill the Cascade River valley as we cast off. Mt. Johannesburg on the left. with the extremely isolated Moraine Lake below. 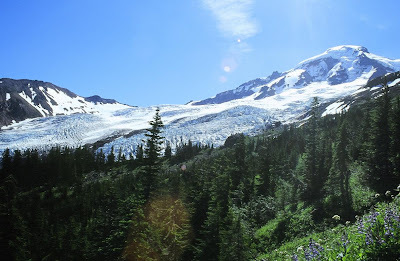 Eldorado Peak (center) and the Inspiration Glacier. To talk to Coley about setting up an ascent or instructional program, please call him at 800-424-2249 or email cgentzel@aai.cc. Guide Justin Wood just reported that glacier conditions on Mt. Baker's two standard routes are holding up extremely well. 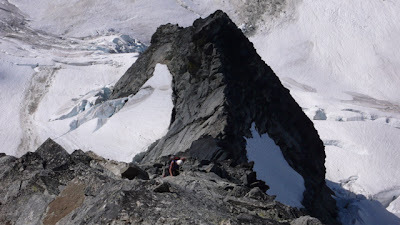 He said that "the climbing conditions on both the Easton Glacier and the Coleman-Demming glaciers are still very good, especially compared to last year at this time of year. All the crevasses are still sporting passable bridges, and there are very few problems crossing the top bergschrund. " This is in part due to the high snow levels the Cascades experienced over this last winter. AAI's next Mt. Baker Ascent is September 1-3, and four spots are still open! For more information, call or email Shawn Olson at 800-424-2249 or shawn@aai.cc. Easton Glacier, see “Early morning Flight Tour” entry below. "In between waves of storms we quickly ascended through crevasses and snow-laden slopes to reach our first summit of the trip of Lachenal at 12,300 feet. Sensing the electrical build up we made for lower ground rather briskly." Read the rest of Tim's report. Check out our current news page, with dispatches, photos, and trip reports from the summer season. If you are interested in talking to someone about our Alps climbs and treks, including Mont Blanc, the Matterhorn, and the Eiger, please call Andy Bourne, our International Programs Coordinator, at 800-424-2249 or email him at abourne@aai.cc. This morning, Dunham Gooding (AAI Director) and Shawn Olson (Communications Coordinator) were treated to an hour-long flight tour of the North Cascades by pilot and AAI Backpacking Guide Jeff Ries (thanks Jeff!). 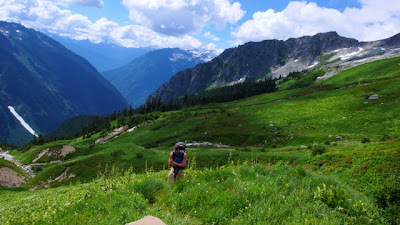 Jeff wanted to check out an area (Copper Ridge and Whatcom Pass) that he was planning to guide during AAI's 5-day September Backpacking Program. Dunham, Shawn, and Jeff met early this morning at Jeff's hanger in Lynden (30 minutes north of Bellingham), loaded up the plane, and started their tour by following the Nooksack River to Nooksack Cirque right below picturesque Mts. Shuksan, Ruth, and Icy. They were also treated to amazing views of Mt. Baker's Coleman and Roosevelt Glaciers. Jeff then headed toward the Northern Pickett Range, where Mt. Challenger, Mt. Fury, and Luna Peak dominated the sky space. From there, they flew to the south sides of Mts. 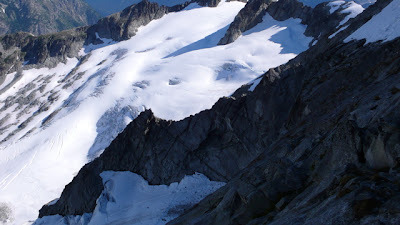 Shuksan and Baker for some close up views - they even saw climbing teams on both mountains! It was a beautiful morning - the three couldn't have asked for a better day to fly. Heading out of Lynden, with the Nooksack River below. The west side of Mt. Shuksan, with the Upper and Lower Curtis Glaciers at the center and upper left. The northwest side of Mt. 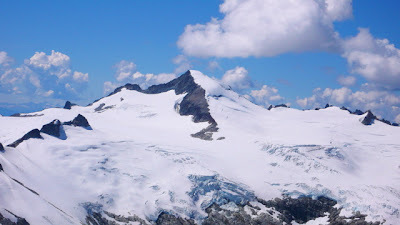 Shuksanwith Nooksack Cirque (left), Nooksack Tower (left of center), and the Price Glacier (flowing down from the summit pyramid). Mt. Fury, in the Northern Pickets. Mt. Luna, also in the Northern Pickets, with the Southern Pickets in the distance. Looking up Mt. Baker's Easton Glacier. Looking down at the Easton. Dunham Gooding (left) and Jeff Ries back at the hanger. View more photos of this flight tour. Photo: BD receiving AAI’s Guides Choice Award, from the left: Kevin Newell (AAI Guides Choice Test Director); Bill Belcourt (BD Climbing Hardware Category Manager and principle design engineer for the C-3); Peter Metcalf (BD CEO); Dunham Gooding (AAI President); and David Mellon (BD Vice President for R&D and Product Category Management). Black Diamond was one of five companies that received AAI’s Guides Choice Award for outstanding gear for 2007. The award was for the C-3 Camalot, and it was presented at the Outdoor Retailer Summer Market trade show in Salt Lake City on August 8th. Approximately thirty-thousand industry professionals attend the OR Summer Market to show and view new products, to set up new accounts, to take or make orders of gear for retailing during following spring and summer seasons, and to launch new products and brands. The announcement of the annual Guides Choice awards are eagerly awaited by the industry and climbing community. Manufacturers value the award because it brings more public attention to the product as well as more industry press, with writers always eager to spotlight particularly innovative gear. Climbers and mountaineers appreciate feedback and nominations to aid their personal selection of and hunt for the best gear on the market. Some of the testing was done in weather that was cold enough for the AAI guides who tested the cams to need gloves. Test Manager Kevin Newell said, “It was unanimous that the big thumb loop and easy grip action makes the C3s easy to use with gloves on; besides being the standard for warm weather rock climbers, C3's continue to be the most functional cam for alpinism in mixed conditions. They are lighter, have a wider expansion range (making them more versatile) and are less prone to freezing in cold and wet conditions than any other cam on the market." AAI tests gear throughout the year by putting it through demanding paces in some of the six states and sixteen countries where it operates. In the case of the C-3s, they were tested in the rock climbing areas of Squamish, BC, Leavenworth, WA, and Red Rock, Nevada, and on alpine routes in the Cascades and Sierra. Thirty-one companies currently hold Guides Choice awards for fifty-six products, with Black Diamond and Petzl setting the record for recognition with seven awards each. BD’s other awards have been for their Camalot C4s, Express Ice Screw, Guide Glove, Dry Tool Glove, ATC Guide, and their Alpha Ice Boot. AAI's Guides Choice website has more information on the testing program, including all current Guides Choice winners. 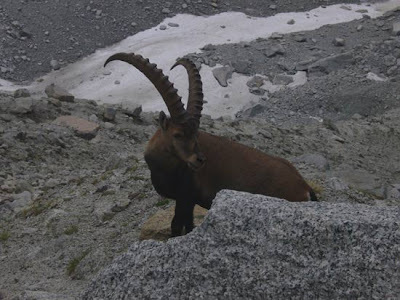 AAI guide Tim Connelly took this photo of an ibex in the French Alps while guiding climber Claude Burton in July of this year. 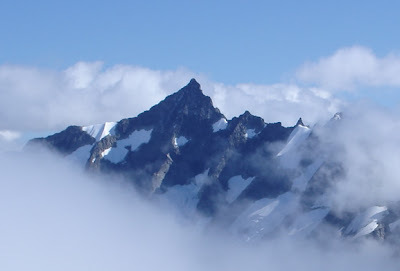 The two were climbing on the Papillon Ridge, which is off the mid-station of the Aguille de Midi tram. Check out the full dispatch. To scroll through the season's complete dispatches from South America, Alaska, the Alps, the Sierra, and the Cascades, go to our Dispatches page. AAI climbers Myron Allen and Adele Aldrich of Laramie, Wyoming, recently completed an ascent of Mt. 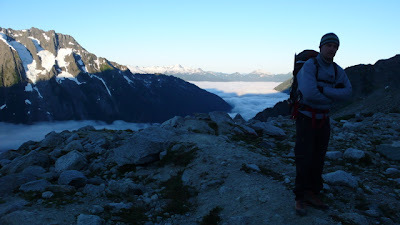 Challenger in the Picket Range of Washington's North Cascades with AAI guide Dawn Glanc. 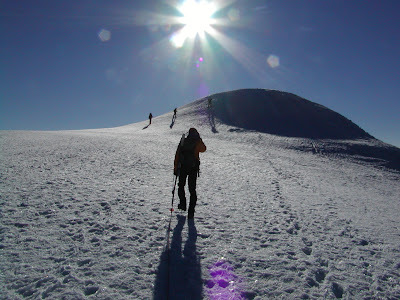 This ascent was part of their Alpine Mountaineering and Technical Leadership program that took place on July 9 - 20, 2007. Here are some photos from their trip! with one snow patch). Photo by Dunham Gooding. At the Big Beaver trailhead, after taking the ferry across Ross Lake. Camp on the Challenger Arm. View of Mt. Fury from Challenger Arm. Dawn leading the last pitch. Adele and Myron on the summit! Desert climb time is nearly here! We start our Red Rock climbing season on September 1st and are taking reservations for group and private instruction now, so book your trip soon to reserve your preferred dates! Red Rock Canyon is located 30 minutes from downtown Las Vegas and offers an incredibly diverse array of stellar sandstone rock climbing. In the summer, the desert sun beats down too intensely to do much rock climbing, but come fall, winter, and spring, Red Rock becomes the perfect rock climbing destination for all ages and climbing abilities. Whether you're heading to Vegas for a business trip, romantic getaway, or family vacation, let us help you enjoy on of the most unique and high-quality rock climbing areas in the country. The cheap plane tickets and reasonable lodging options in Vegas make this an affordable vacation choice! Check prices. Gear rentals and transportation from Vegas to Red Rock available. Individual and group programs, all levels.